This entry was posted on 10/22/2009 06:23:00 AM and is filed under BARACK OBAMA , JESUS CHRIST . You can follow any responses to this entry through the RSS 2.0 feed. You can leave a response, or trackback from your own site. 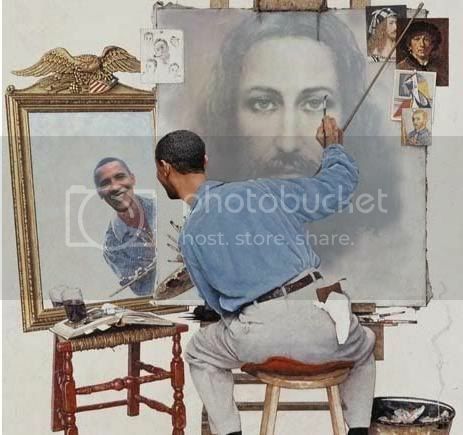 Has anyone else ever noticed how it's always & only wingnuts who like to say that Obama thinks he's the messiah? Or like to project onto liberals that we see him as the second coming? Bc none of my Dem/progressive friends & acquaintances have ever felt this way. We see BHO as a reasonably good Pres (well, in comparison to the last POTUS: outstanding! ), potentially a nice guy (but who cares), but also flawed and liberals call him on it. Oh well: more RWF teh stooopeds. Regarding ferschitz' comment about the Obama/Messiah obsession of the rightwing. This has to come from a deep well of psychological projection having its origin in 9/11, the belief that Bush would protect the USA and lead us to victory over our enemies (sounds like a messiah). Combine that with Bush,s utter failure do almost anything well, and the Right would like to forget that they ever put that much trust in Bush. And what's the best way to forget our mistakes? SCAPEGOATING and PROJECTION!